Holy Moly! What a week! Our family enjoyed some beach time with a hurricane thrown into the middle of it and I ran an awesome 5K yesterday to top off an already fantastic week. This is gonna be one super sized rundown! I had no expectations for my running this week. A week at the beach is all about rest and relaxation and I just wasn’t stressing keeping up with miles. I actually did fairly well! I ended up with 24 total miles, running several one mile days to keep my streak going and a Monday tempo run before we left and a mid-week “I gotta beat Hurricane Arthur!” speedy run. 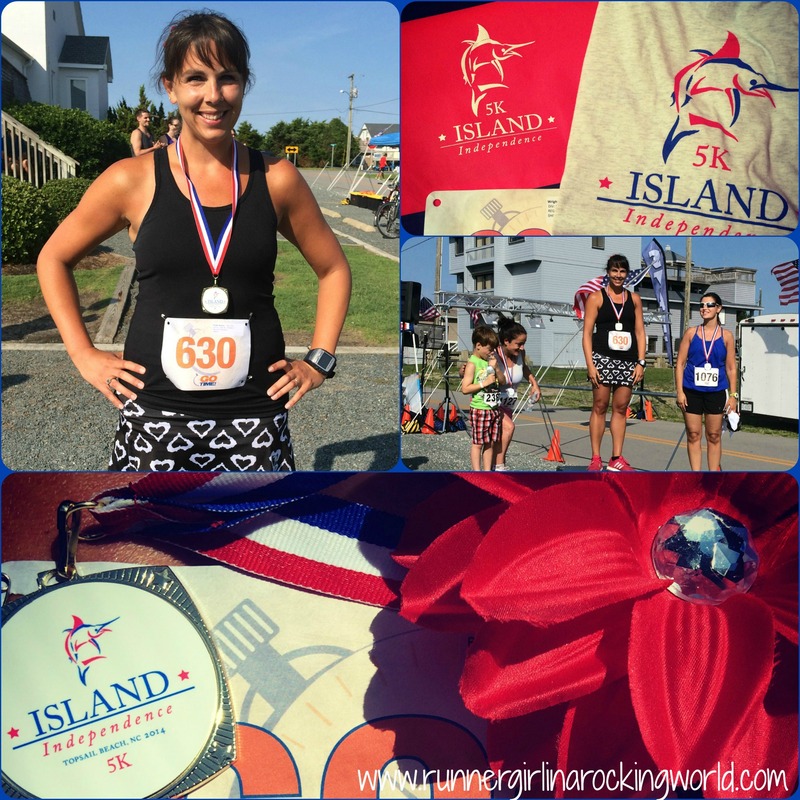 I went into Saturday’s Island Independence 5K on very rested legs. I finished off the week with a decent 10 miler today with friends. I kept up with my three current challenges (2 arms and one ab) too. Overall, no complaints! 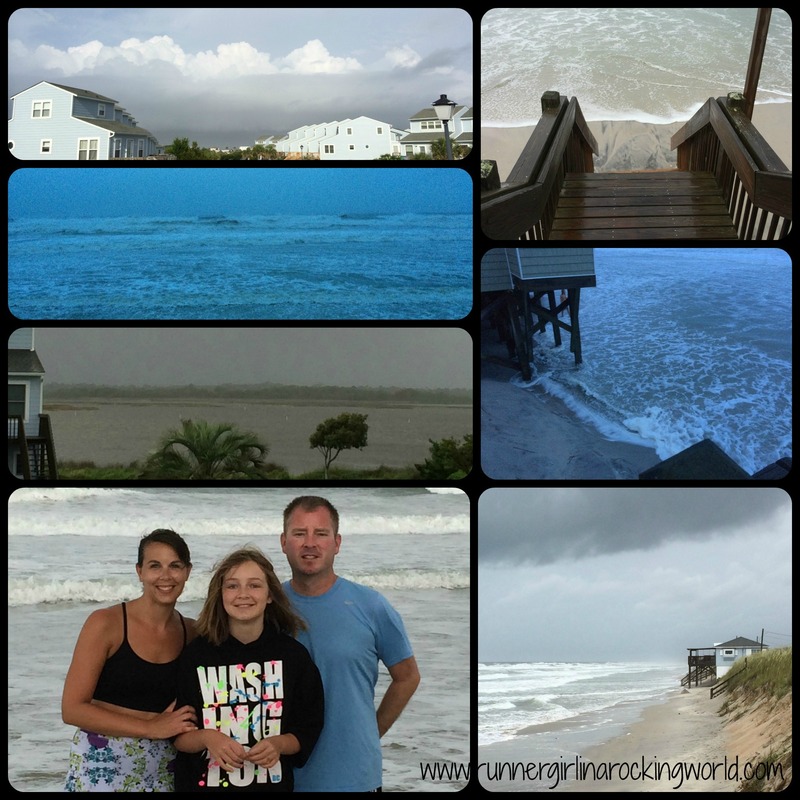 I signed up for the Island Independence 5K in Topsail Island, NC on a whim. Having no details other than what’s on the website, I knew that it was a small 5K, but surely a festive one! Any races at the beach are always fun! 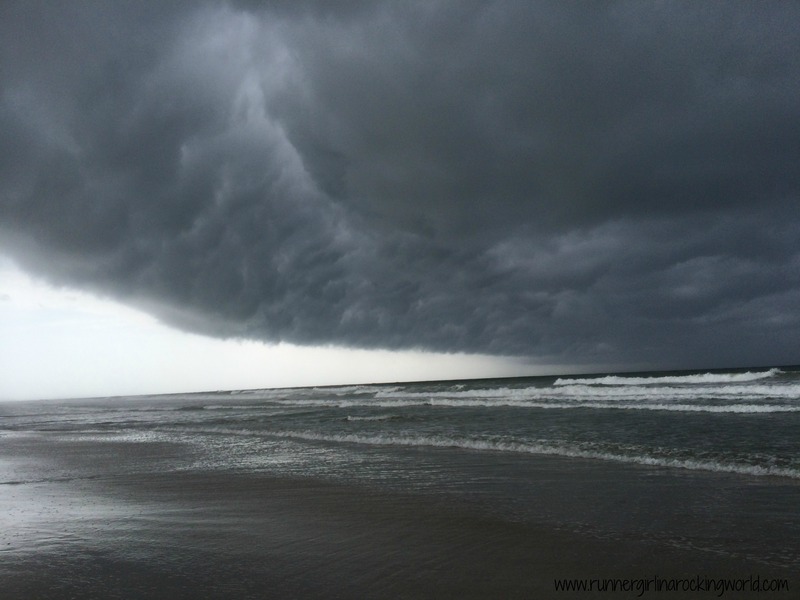 I was a little nervous though running a beach run in the middle of summer, but thankfully, after Hurricane Arthur came through, the temperatures yesterday morning were seasonably cool and there was a nice breeze. The course was a loop and I knew that the first two miles I would have the sun at my back and a tailwind and the last mile would be all sun and a headwind. I had to run my best the first two miles and save something in the tank for the last mile. I also knew that based on the size of the race that I’d have a good chance of placing in my age group if I had a decent run. I guessed that anything under 27:00 (per previous year’s times) would be in contention. Since I’m currently not training for anything, I wasn’t quite sure what I’d be able to do. I felt tired going into the race and I would know within the first half mile whether it was a good race day or not. It was a good race day! I looked down at my watch around a half mile in and I was comfortably keeping right a 7:58 pace. I backed it up just a bit to run an 8:05 for the first mile. I am a complete crazy person on a 5K with pacing. On a 5 mile progression run, I’m golden…on a 5K, it’s hit or miss. I ran the second mile in a 7:58 and still felt strong and not really tired yet. Once I turned the corner to finish the last mile, the sun was there and a pretty decent headwind. I could feel the struggle start and I so didn’t want to lose it too bad. I tucked behind a guy and hoped that he was blocking the wind enough for me. It seemed to help and I only dropped down to a an 8:10 pace. I kicked it for the last .10 (7:06 pace) and finished with a 25:07! I was super stoked! Once the results were posted, my time was not listed (again! 3rd time now by this race company) so I filled out all the paperwork and waited to see where I placed in my age group. Everything was fixed and I had placed first in my AG!! I had run well enough and I couldn’t have been happier to have placed! It’s not something that happens often. I would certainly enjoy running this race next year and would consider it if we were at the beach during the same week. It was an inexpensive 5K and we also got really a really great blended tee and a backpack! If you saw this, would you freak out?! Cause we did! Yeah, that’s with no filter too. Scary, huh?! That would be the start of Hurricane Arthur which came in on Thursday afternoon. Going into the week, we knew that it was coming, but thankfully, it would not be too strong or last long so there was no need to have to cancel or alter our trip. A hurricane is definitely one of those things that I’d love to witness and this was the “safest” way to do so. We talked to many locals who all advised us to stay. They likened this storm to a nor’easter in the winter. Also, add in the fact, I’m married to a weather nerd. If Nick wasn’t stressing the hurricane, neither were we! It moved to a Category 2 storm when it finally showed up, staying offshore, and we felt sustained winds ranging from 20-35 mph for the majority of the storm. Towards the last few hours, sustained winds jumped to 40-45mph with 60 mph gusts! I can’t really wrap my head around anything stronger nor would I want to feel it either. It was definitely an experience that we’ll never forget! Luckily, there were several breaks in the storm and we were able to run down to the beach at various times throughout the 12 hours to take pictures and to see one angry ocean.